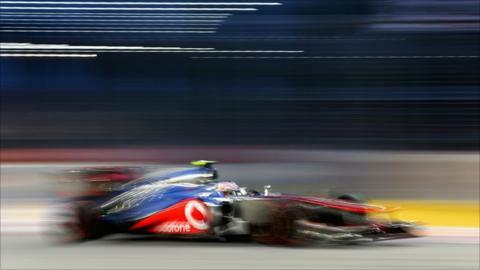 McLaren's Lewis Hamilton took a sensational pole position for the Singapore Grand Prix. The Englishman was nearly half a second clear of his closest rival, the Williams of Pastor Maldonado. Red Bull's Sebastian Vettel was third, ahead of McLaren's Jenson Button and Ferrari's Fernando Alonso. Force India's Paul di Resta was sixth, ahead of Red Bull's Mark Webber. Lotus driver Kimi Raikkonen, who is third in the championship, was 11th. The Finn's team-mate Romain Grosjean was eighth, ahead of the Mercedes drivers Michael Schumacher and Nico Rosberg, who did not set a time in the top 10 shoot-out. Hamilton's pole was his third in the last four races and came in stunning style. He set his fastest time of one minute 46.362 seconds on his first flying lap in the final part of qualifying and none of his rivals were able to get anywhere close to him on their final runs. "The guys have done a fantastic job all week," said Hamilton. "Sebastian [Vettel] was incredibly fast through most of the sessions so I'm very happy that I managed to pull that time out at the end. "Trying to find a gap in qualifying is hard and making sure everything is up to temperature is hard too so I feel very fortunate that I got the time I needed." Hamilton was 0.442 seconds quicker than Maldonado - and 0.577secs ahead of Button, who has been off his team-mate's pace all weekend. "We were working very hard," said Maldonado. "At the beginning the weekend, we got a bit lost on set-up. We were trying to adapt the car to my style, we find a very nice balance especially in qualy two and qualy three." Vettel's performance was a surprise - the German had swapped fastest times throughout the weekend with Hamilton but was slower in the final part of qualifying than he had been in the second part. Fernando Alonso has a strong record in Singapore, finishing on the podium in three of the four years the race has been held. "[I'm] a little disappointed," said Vettel. "Especially Q3, I don't know why we couldn't do the step. But third is a good position to start from. It's a long race and a lot can happen." Red Bull team boss Christian Horner said: "We did seem to lose a little bit of the rhythm there, especially on the out-laps." Alonso's Ferrari has not been on the pace all weekend and the world championship leader was 0.854secs slower than Hamilton. But the Spaniard's race pace looked strong in Friday's second practice session. Schumacher and Rosberg scraped into the top 10 shoot-out but did not set a time, running only briefly on the slower, more durable, 'soft' tyres so they could start the race on them. The rest of the top 10 will have to start on the 'super-soft' tyres with which they set their qualifying time. Sauber's Kamui Kobayashi was the leading driver who failed to progress beyond the the first part of qualifying alongside the teams that were new to F1 in 2010, Caterham, Marussia and HRT. The Japanese, who started on the front row in the Belgian Grand Prix three weeks ago, will start 18th, after being knocked out by Toro Rosso driver Jean-Eric Vergne. Kobayashi said he was not happy with the behaviour of the car. "I had huge oversteer, which is something I cannot handle on this circuit," he said. "It's very strange."